BYFLEETERS sailed to the Rec on Saturday afternoon to soak in the sights, sounds and tastes of the summer. Kicked off by King and Queen, Elliott Lee-Seymour and Poppy George, Byfleet Parish Day captured the imagination of those who live in the village and visitors from all corners of the borough. 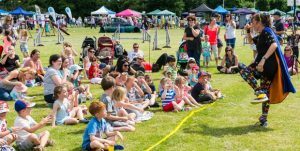 Capitalising on what proved to be a rare period of sunshine in what has otherwise been a wet and windy summer so far, the annual festivities took the recreation ground by storm at the weekend. Special guests included actor and former Byfleet Players am-dram member Peter Davison and his wife Elizabeth, as well as this year’s Miss Surrey, Sophie King. Dozens of stalls surrounded the main arena where a dog show, dance performances and other entertainers helped rev up the bumper crowd on a dazzling day for community spirit. Among the top canines being shown was Tilly, who helped owner Eryn Butters scoop the ‘Dog with the Waggiest Tail’ prize. Meanwhile, kids’ favourite entertainer Jelly Kelly whipped up a frenzy of giggles with her unique brand of comic relief, while the traditional array of raffles, tombolas and fairground attractions gave Byfleet all the fun of… well, the fair! The talented troupe from the Susan Robinson School of Ballet laid on a performance all their own, sauntering in the sun to rapturous applause from their audience. Elsewhere, falconry displays had eyes firmly fixed on swooping wings and fearsome beaks and claws, while Woking Rugby Club – who play their home fixtures on the Rec – were to be seen ‘scrumming’ together to help make the day a great one. Plant growing competitions and artistic contests had entrants battling it out for coveted silverware and, while not everyone went home with a trophy, organisers certainly deserve a medal for yet another smash hit Parish Day.